To the sitemap / website-navigation (Click enter). To the content (Click enter). Change language: Deutsch (Click enter). To the homepage (Click enter). 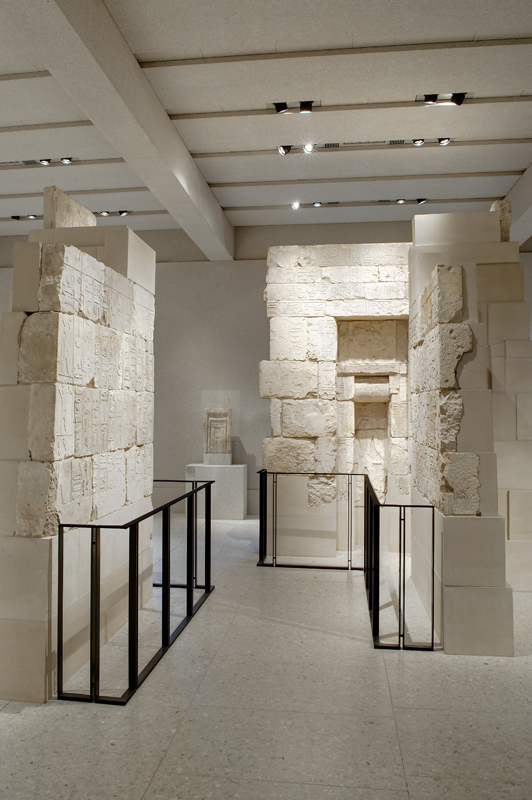 Berlin is in the unique position to own three grave chapels dating to the time of pyramids (ca. 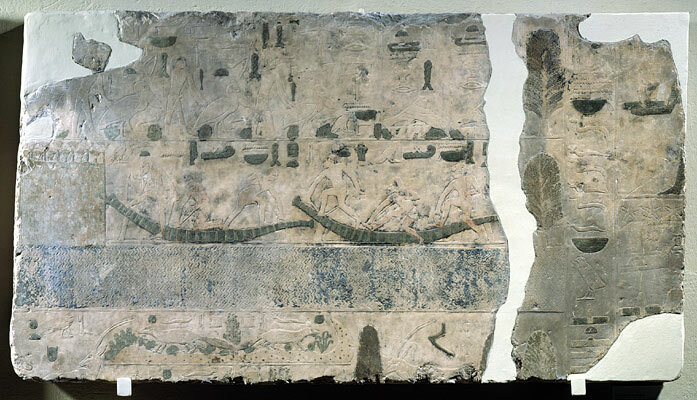 2600�-2300 BC) , which display a large amount of scenes of handicraft and farm work of the animal and plant world produce a kind of handbook of life on the Nile. The main element of the chamber is the false door behind which the shaft to the burial chamber used to be.The grave chapels were not visible since their evacuation from the museum for protection in 1939 and can now for the first time be rediscovered. der Verwandte des Königs, Vorsteher der Güter des Palasts, Priester des Königs... der Erwürdige'. Inv.-No. ÄM 1105 Die Grabkammer des Metjen, um 2600 v. Chr. 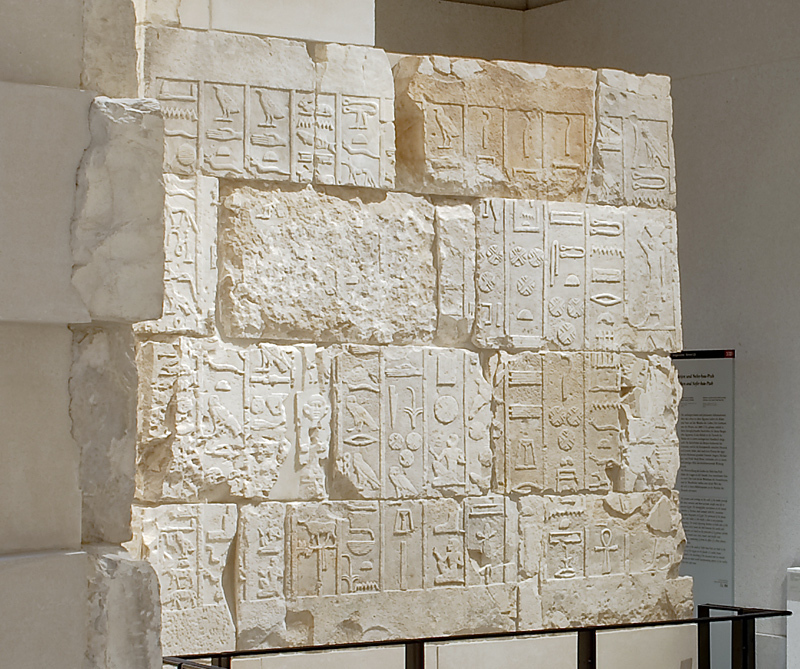 gebaut, enthält in ihren hieroglyphischen Inschriften die älteste Biographie Ägyptens. In den Reliefs ist die Tierwelt des Niltals wie in einem zoologischen Handbuch dargestellt. Metjens Titel sind vielfältig und werden an den Wänden aufgezählt, z.B. nennt er sich Verwalter mehrerer Gaue und Hoherpriester. Als Oberjägermeister des Königs überwacht er die Jagd in der Wüste. Er besitzt unter anderem einen Garten mit Feigen und Weinstöcken. Wichtige Opferszenen mit verschieden gekleideten Dienern und Opferträgern präsentieren dem Verstorbenen alle Güter und Opfergaben, die dem Komfort in der Unterwelt dienen, darunter auch Hausrat, Gewänder, die Ausstattung des Grabes und Tiere der Jagd. Die Opferkammer wurde aus ca. 100 einzelnen Blöcke zum ersten Mal für die Ausstellung im Museum wiedererrichtet. 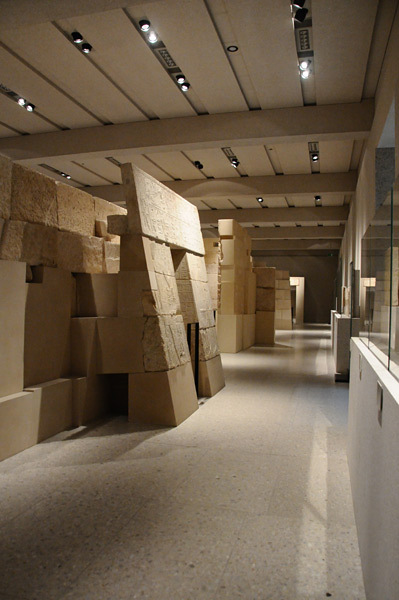 In the reconstructed walls of the courtyard destroyed during the war can be seen ancient Egyptian temple reliefs from Karnak and from the Temple of Queen Hatshepsut in Deir el-Bahari. 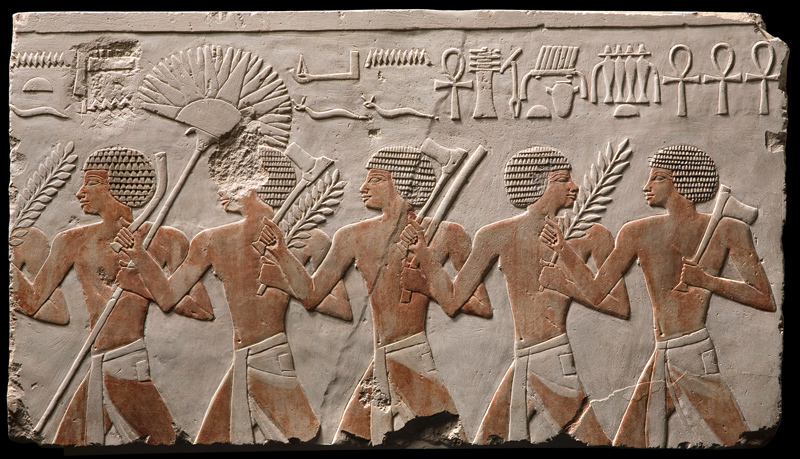 They show a ceremonial procession on the Nile escorted by Egyptian soldiers and Nubian mercenaries.The reliefs from the Sun Temple of Ni-user-Rê in Abu Gurob which show animals of the desert and the people going about their daily work, building boats and tending their crops, merge to a figurative hymn to the creative power of God. The very shallow reliefs preserved in their original colours belong to a sequence of pictures which depict the seasons in a series of typical scenes. 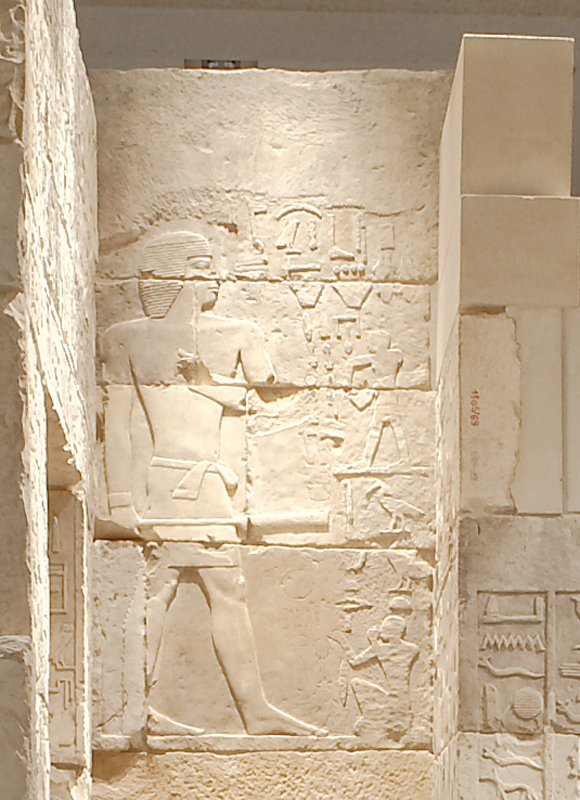 Relief aus dem Totentempel der Königin Hatschepsut Festprozession der ägyptischen Soldaten bei der Feier des 'schönen Fests im Wüstental'. Inv.-No. 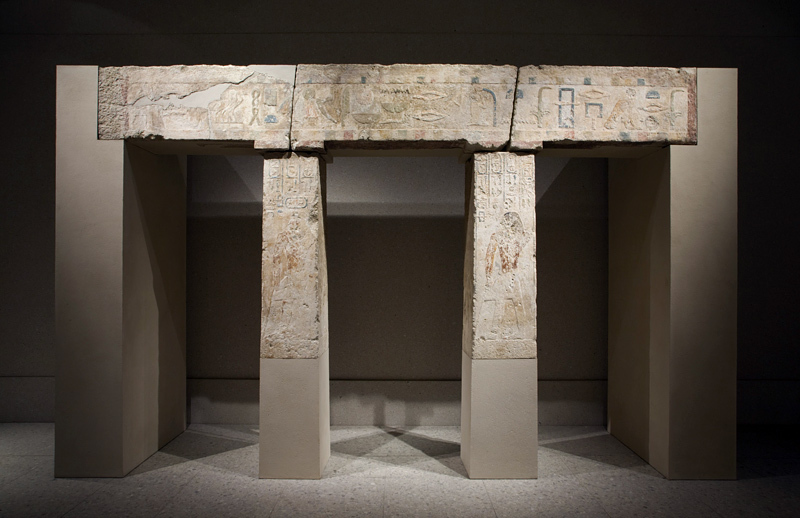 ÄM 20036 Since the beginning of the 4th Dynasty the kings call themselves 'son of the sungod Re'. In the honour of this god the kings of the 5th dynasty erected special cult centres in the middle of which an obelisk was placed. Especially famous is the sun complex of Nyuserre with its reliefs showing the world of animals and plants which reflect the influence of the sun on nature during the course of the year. The accompanying text describes the way of life of these animals.